Last week it rained for seven days straight. Now, in this part of the country that type of weather pattern may not be in any way unusual, but that does not erase the fact that it is also unpleasant. Being as though I have lived here long enough to know that summer comes late to the Pacific Northwest (but also, thankfully, lingers leisurely into the autumn months), I coped with this long stretch of wet and dreary weather in the most reasonable manner possible: I pretended it was summer. Imagine the days are long and sticky hot. It’s too hot to turn on the oven during the day, so you wait until the sun sets before you satisfy your desire to bake something. The heat of the day breaks at around 8PM, but there is a bright glow that lights the sky until well past 9PM. In the morning, you head into the garden to pick some strawberries. The berries are warm from the morning sun, and you can smell their sweet juice on your hands as you gather them. By 10AM it is starting to get warm. Knowing what the temperature will be like in just a few short hours, you plan ahead and start to assemble a simple cream filling for the tart shell you baked during last night’s reprieve from the heat. 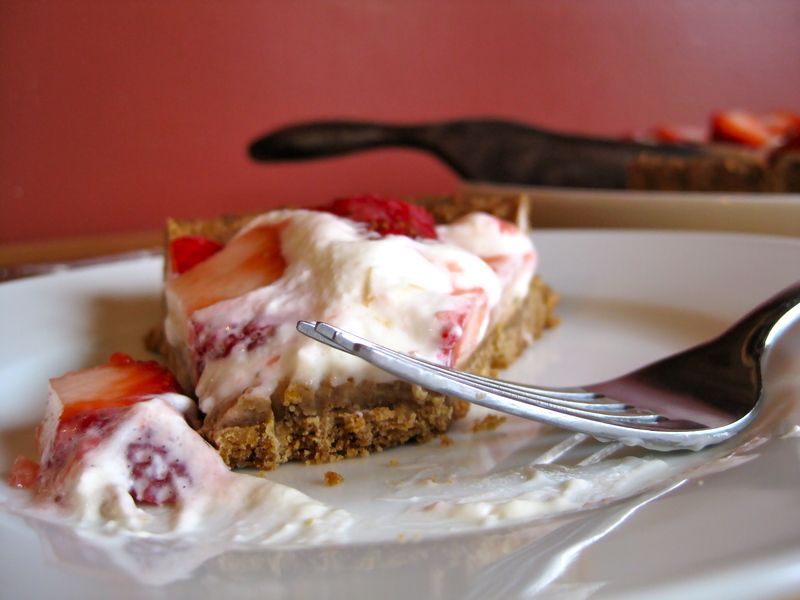 Kept in the refrigerator, the cool cream, topped with fresh strawberries, will prove to be a welcome treat that cuts through the sweltering late afternoon sun. And that’s how we made it through the week. Though the berries didn’t come from our garden (we’ve got at least another two and a half months before we see any action in that area), and the days were not anywhere close to being even remotely warm, that didn’t stop us from enjoying this tart any less. We pretended we were eating it in the backyard as we swayed lazily in a hammock and listened to the soft hum of the sounds of summer. The good news is that summer will always turn up, even if you have to wait through another soggy and wet season in order to reach it. 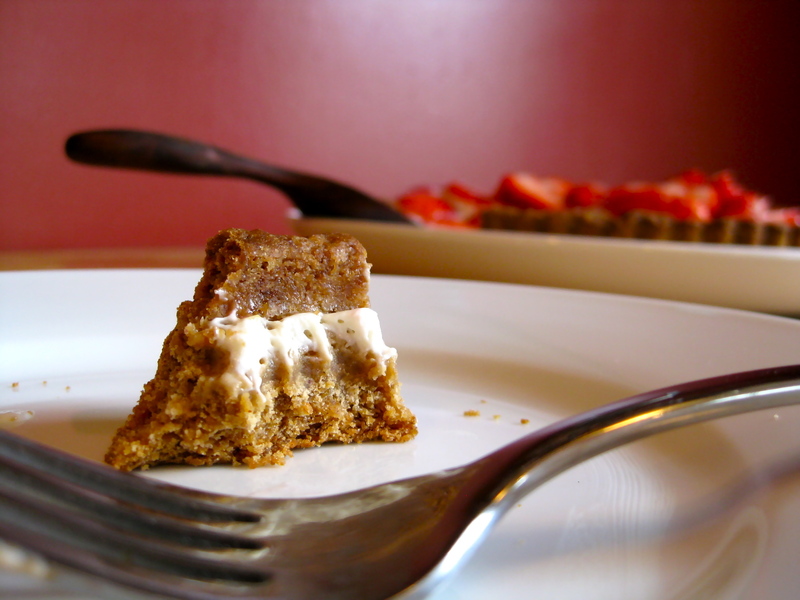 The even better news is that you can make this tart now, no matter the season and no matter the weather, and that when it comes to enjoying the tart, there will be absolutely no faking required. 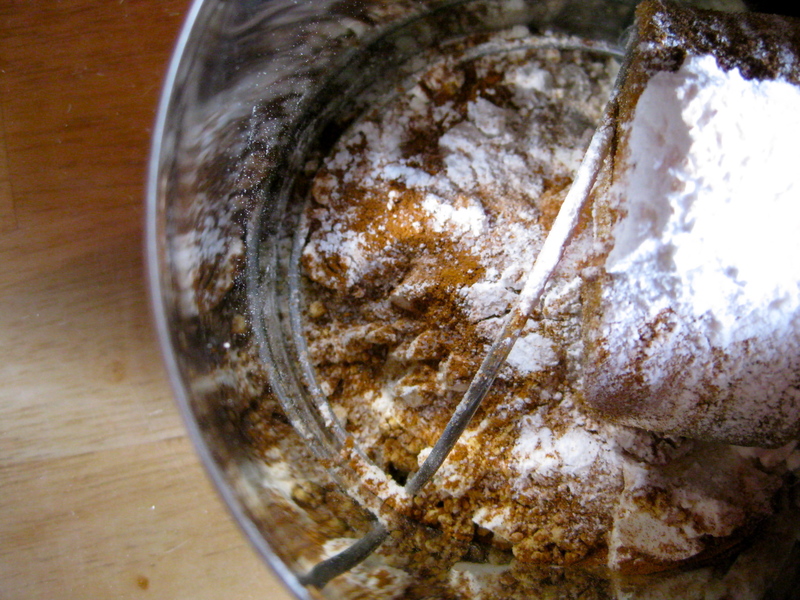 In a medium bowl sift together the flour, brown sugar, ginger, cinnamon, allspice, salt, and baking powder. Cut the butter into the dry ingredients with your fingertips or a pastry cutter until the mixture is crumbly and resembles cornmeal. 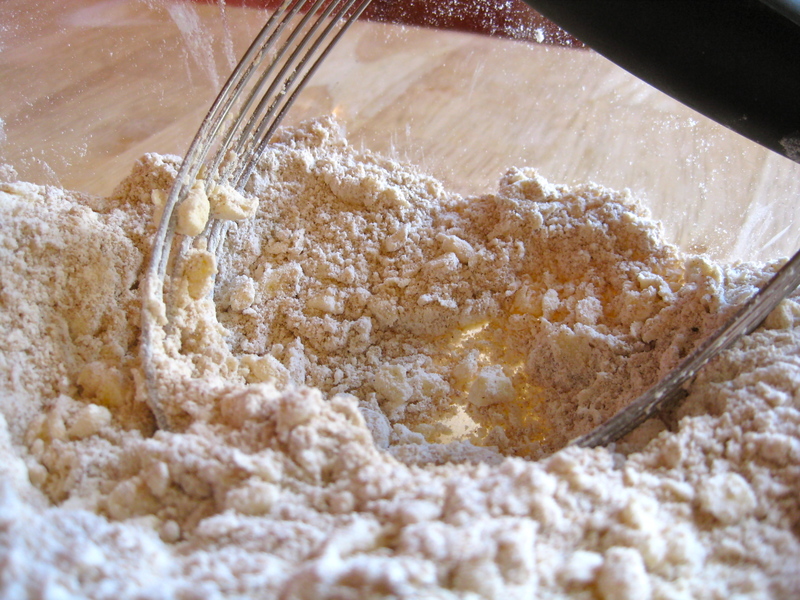 Drizzle the molasses and water over the dough, mixing with your fingertips until the crumbs of dough begin to cling together. Gather the dough together and knead it into a ball. 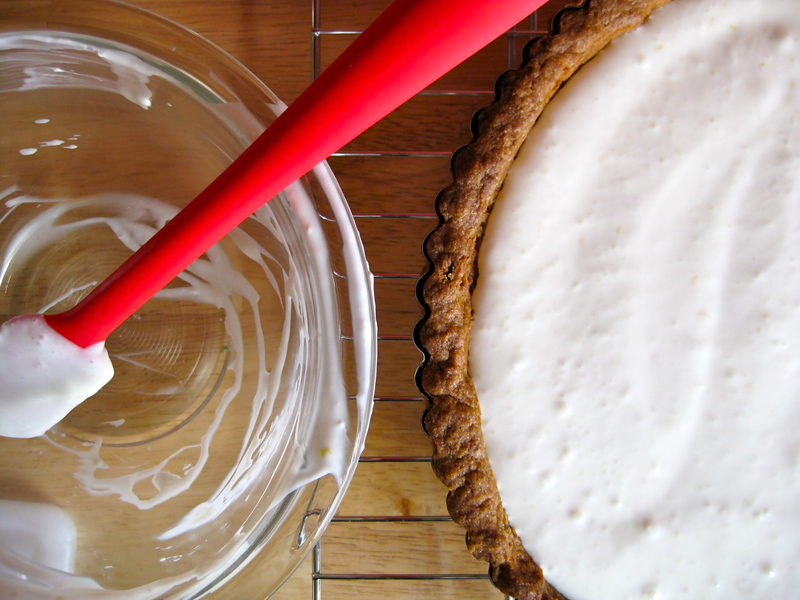 Press it evenly into the bottom and sides of a 9″ tart pan. Pierce crust on sides and bottom with fork. 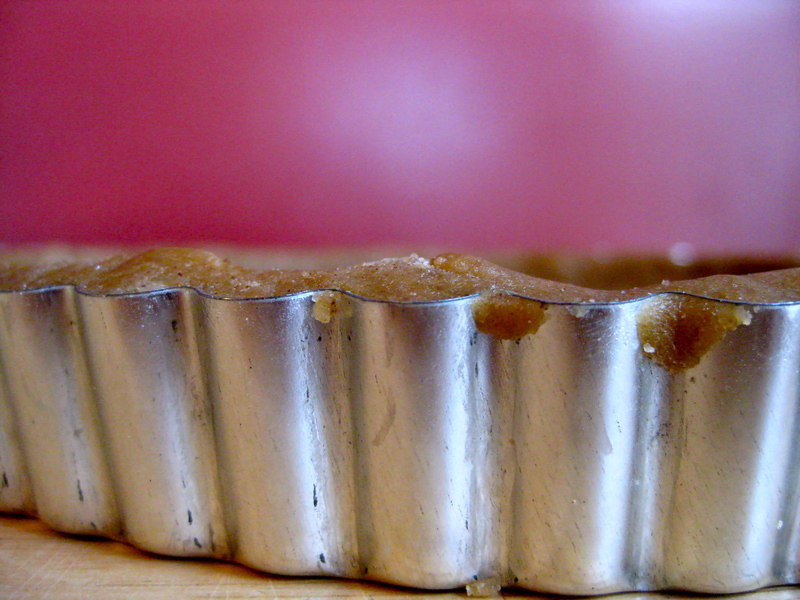 Gently fit a large piece of aluminum foil tightly against the crust. Fill with pie weights (you can use dried beans or large handful of pennies, but, being someone to bakes a great deal, I like to use these super handy ceramic pie weights) and bake for 25-30 minutes, or until the edges of the crust just begin to darken. 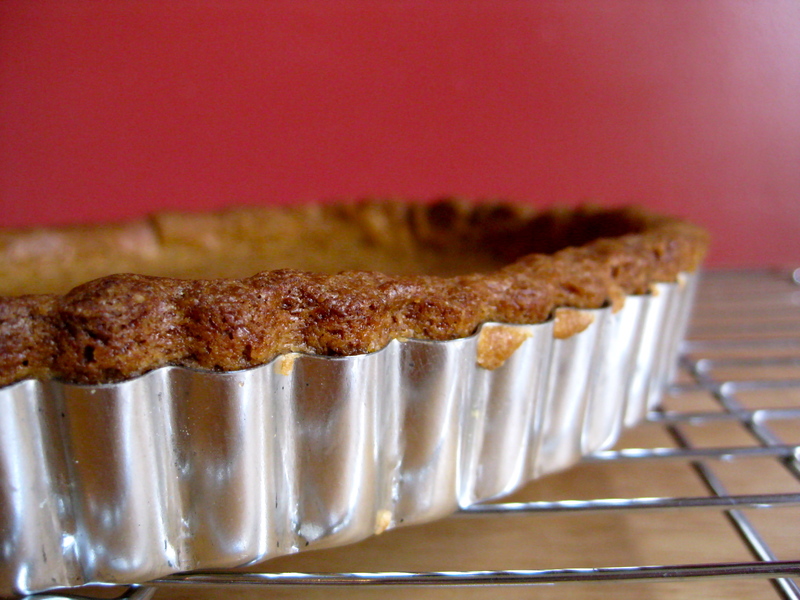 Remove foil and weights from tart pan (it’s best to just gather up the foil by the edges and lift the whole thing out, weights and all), and continue to bake the tart crust for 10-15 minutes more, or until crust is firm and darkly browned. In a bowl with a mixer on high speed, beat together yogurt and cream cheese until smooth. Add lemon zest and stir to combine. 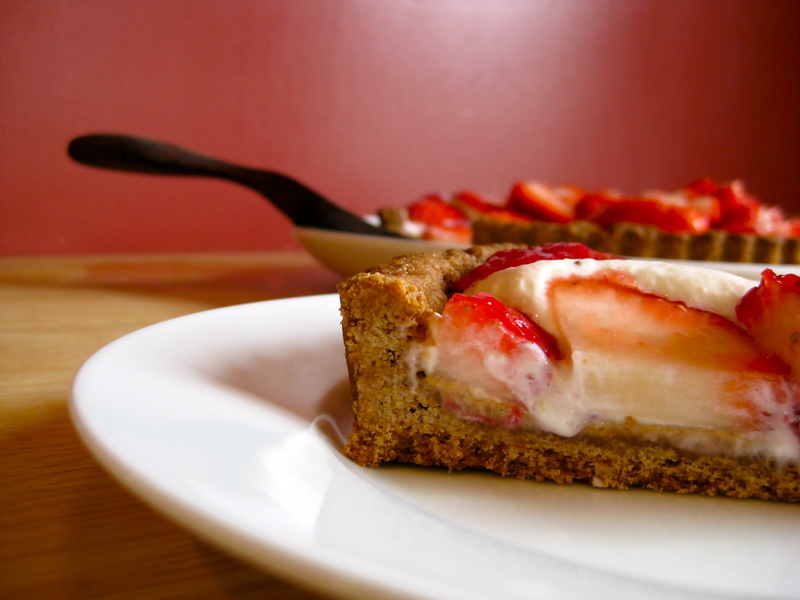 Pour yogurt and cream cheese filling into cooled tart shell. Refrigerate until chilled and slightly firmed (it will never reach actual firmness, so don’t aim for a sturdy filling), about 2 hours. 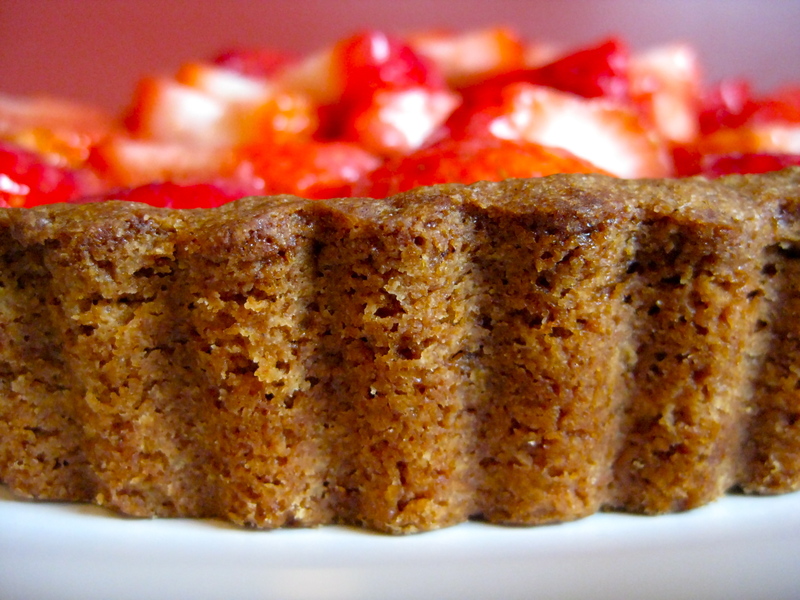 When filling has chilled, arrange strawberries on top in whatever manner you choose. 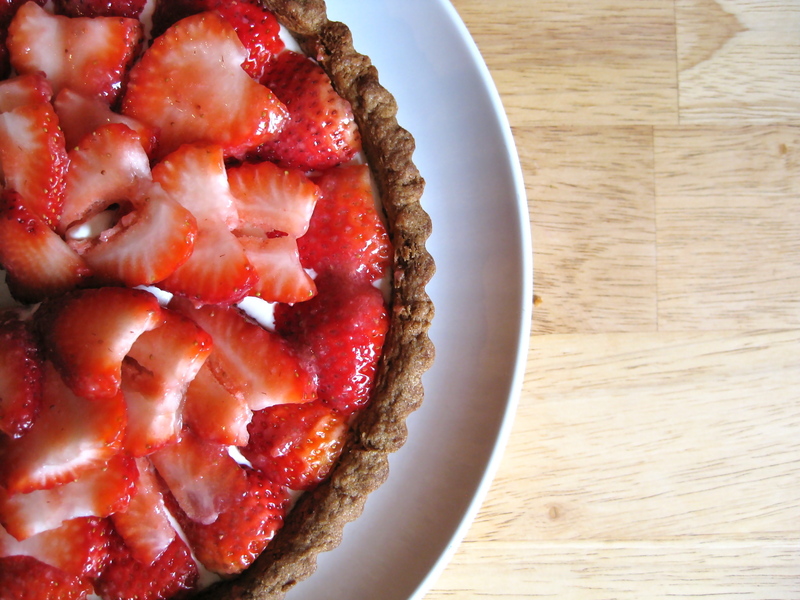 I layered them in overlapping circles, but I promise you that the arrangement of your strawberries will in no way compromise the taste of your dessert. 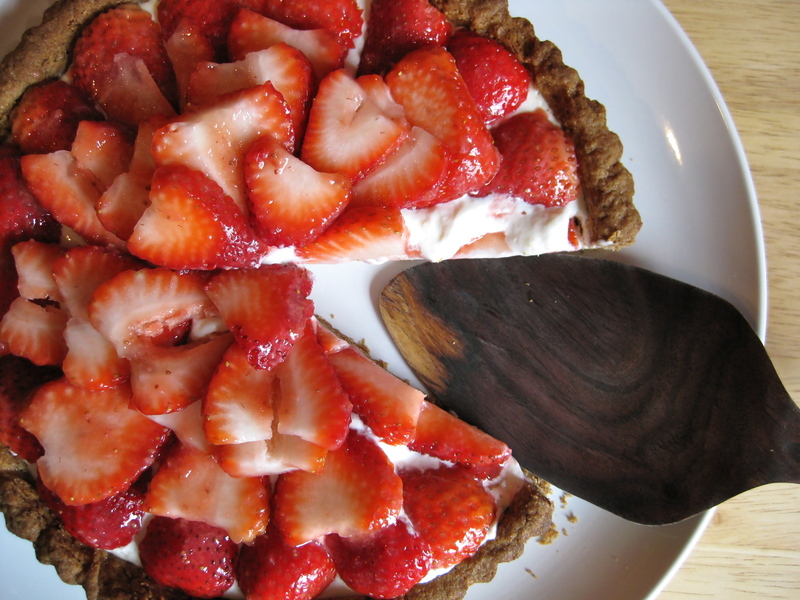 If your strawberries are off season, as these were, and not at peak sweetness, you can apply a very light glaze on top of the berries to coax out a bit more strawberry flavor. 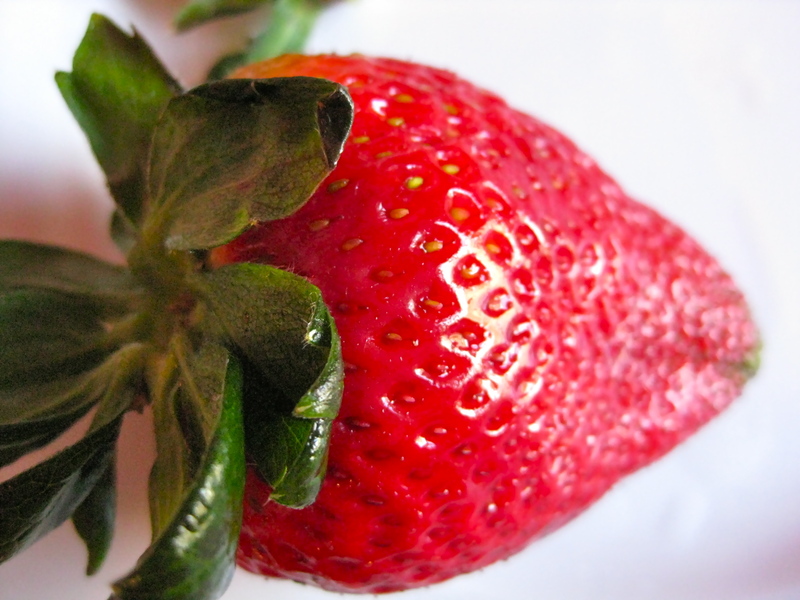 Simply toss a couple of large strawberries into a small food processor or blender, along with two tablespoons of water, 1/4 teaspoon of sugar, and a pinch of cornstarch. Blend together until smooth, then pour into a small saucepan set over low heat. Stir over low heat until strawberry mixture has thickened slightly and just begins to simmer. 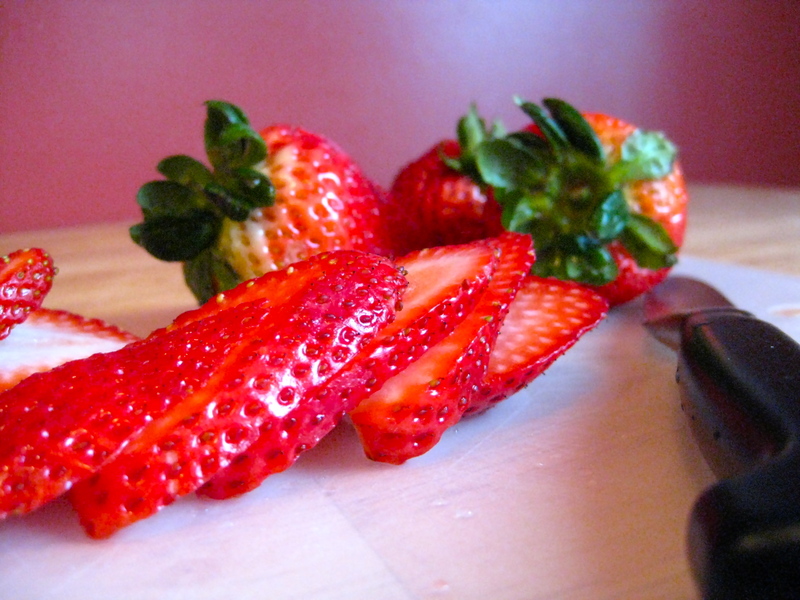 Let mixture cool slightly, then lightly brush over arranged strawberries until just covered. I love the description of a hot summer day…it transported me to warmer times and warmer climes. I also like the progression of eaten pie pictures. Very nice. I had a good time photographing the progression of eaten pie pictures. Ahem.